As we bask in the glow of a progressive victory, Bush and Cheney are still trying to burn Rome to the ground. And most of us in the blogosphere, not to mention the country, are so focused on this endless campaign that we have forgotten that the men who so royally screwed our country are still in charge, and are apparently not interested in stopping their ideological madness as their time in power ends. 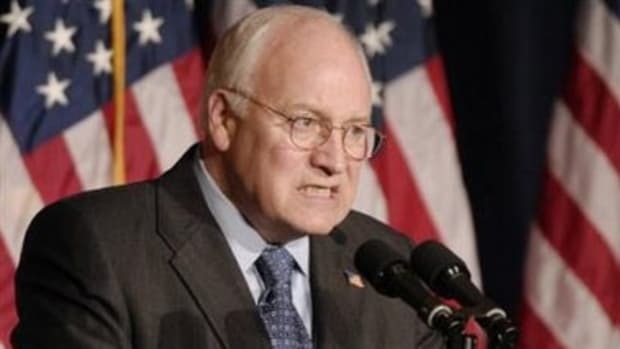 I bring this up because apparently, they (and by &apos;they&apos; I mean Cheney, who is really the driving ideological and practical force behind all of this madness) are trying to force the Iraqi government to agree to a &apos;strategic alliance&apos; which will essentially allow the U.S. military to have free reign in Iraq for ever and ever. This includes immunity from normal laws and prosecution, control of Iraq&apos;s air space under 29,000 feet, and even the right to arrest and detain anyone it wants as well as the unrestricted right to conduct full scale military operations. And of course the only people diligent enough to keep tabs are the British press, in this case a fantastic newspaper called The Independent which has it as their main headline. We should take heed and not allow the criminals to work in the dark. For Bush and Cheney, who prefer to operate in secrecy anyway, the fact that they are barely a footnote on most news these days is the best thing that could happened in the waining days of their corrupt and soulless administration. Finally, when they have no more to lose but so much to destroy, and hide, we stop what little scrutiny and oversight there was in favor of just focusing on Obama and the possibilities for the future. We cannot forget that these men are not simply bad managers, but the archetypes of a corrupt system. They are the problem we are fighting against, and to lose sight of them could allow untold amounts of new damage to happen. Though it is important and relevant to look to the future, we cannot get distracted from the present. I wonder how much of the country&apos;s business has actually been taken care of in the past 2 years? For half that time, many of our best legislators were out campaigning instead of governing. It also makes me curious...has the media intentionally found a new way of letting Bush & Co get away with their insane ideological agenda or is only covering the election an unintentional gift in their final months?